Let’s talk first jobs and ice cream. One of my first working gigs was at a soda shop attached to a movie theatre – Midwest theaters did it right. I was about 16 and I snagged the job “soda jerk,” which meant I scooped all the ice cream sundaes, shakes, apple pie a la modes, and made fresh cherry limeades. Basically, I looked and smelled like a giant popsicle by the end of the night. It was kind of the dream, except for two things: 1) Restocking involved lugging dozens of 10-pound ice cream containers around with my weak chicken arms. And 2) being around ice cream all day. Hello temptation. My favorite flavor combination has always been some form of chocolate, banana, and peanut butter. I’m surprised I never put bananas and peanut butter cups between bread and called it lunch (but now that I think of it, that’s a good idea). We were allowed a minimal amount of treats while at work and only received a small discount on food, but that never stopped me from ordering giant salads during my lunch break and then whipping up a hot fudge peanut butter banana shake for my car ride home. Life was good. Not much has changed these days. I still love all things peanut butter, banana and chocolate. However, with dairy out the door, I reach for cashew- and coconut-based frozen treats. Another favorite – and perhaps the most simple creation – involves frozen bananas. 1) It requires just 5 ingredients and 5 minutes to make. 2) It’s naturally sweetened and relatively healthy. 3) It tastes seriously close to a real milkshake! This has been my go-to mid-afternoon snack when I can’t quite make it till dinner or a healthy dessert when I want something sweet. But really, it’s so healthy and satisfying that it could even be a suitable breakfast. If you try this recipe, let us know! Leave a comment and rate it, and be sure to take a picture and tag it #minimalistbaker on Instagram! We LOVE seeing our recipes come to life in your kitchens. Cheers, friends! 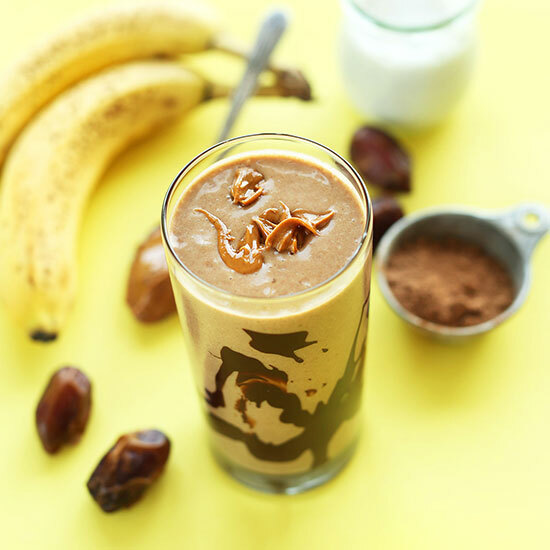 Easy, 5 ingredient chocolate peanut butter banana shake with a thick, creamy texture and tons of chocolate-peanut butter flavor! A perfectly healthy vegan breakfast, snack, or dessert. Add all ingredients except almond milk to the blender. Add in almond milk 1/2 cup at a time, adding only enough to allow the ingredients to blend together. Add more for a thinner shake and less for a thicker shake. Taste and adjust flavors, adding more banana or dates for sweetness, cacao for chocolate flavor, and peanut butter for saltiness. Optional: Add a handful of ice for extra thickness. Serves 1 generously (as original recipe is written). Best when fresh, though leftovers will keep covered in the fridge for up to 24 hours. You could even freeze this into popsicles! I added in about 1/2 cup organic peanuts I keep in the freezer and used date syrup (2tsp, only dates) I got at the Indian foods market. I also added about 1 TB flax + hemp hearts each, 1tsp cinamon and 1 scoop protein powder + 1 large handful spinach leaves. Sooo good. I could have ice cream every day and this is better. Yum! Thanks for the lovely review and for sharing your modifications! Sounds delicious! I have made this recipe at least 8 times, but today I added about a cup of power greens (mixed baby kale, spinach, chard, etc). Pow! It really adds lightness and freshness to an already stellar smoothie. Hi everyone! im stickler for chocolate thickshake! Just made this for breakfast. SO YUMMY!! One date was plenty, and I added 2 Tblsp hemp seeds for extra protein. Absolutely delicious, Dana. Love your healthy, plant-based recipes. We’re so glad you enjoyed it, Jann! I wasn’t planning to make it for breakfast it looked too heavy for early morning, but wow its my new favorite smoothie recipe! Note: I didn’t add the dates and only used 1 teaspoon of cocoa powder. So not being a big smoothie fan I had this presented to me in a nutrition class. It’s flavor is awesome! So I took it one step further. You know those Tupperware popsicle forms? One smoothie makes 6 popsicles and they’re in the freezer ready for an evening treat! My favorite go-to shake recipe. SO flavorful for so few ingredients. Whenever I have chocolate almond milk on hand, I add in a 1/2 cup of that, plus 1 cup of regular unsweetened almond milk. Fantastic recipe… Thanks MB! Now you know :P Glad you enjoyed it, Allison! Howdy! Quick question that’s totally off topic. Do you know how to make your site mobile friendly? My weblog looks weird when viewing from my apple iphone. I’m trying to find a template or plugin that might be able to correct this issue. If you have any recommendations, please share. With thanks! Hi! You might find our free email series helpful! You can find it here. This recipe looks great, but I’m looking to adapt the ingredients to make a sauce, if you will, as the base for a dessert pizza. Would you be able to help me adapt this recipe to be suitable for my needs? I’m a novice cook. Hi Cameron! You may be interested in our 7-Minute Vegan Chocolate Syrup to use instead? You could probably add a taste of peanut butter to make it closer to this recipe, but we haven’t tried! Good luck! My boyfriend (meat and dairy loving Midwestern man) loves this smoothie and so do I! I didn’t have all of the ingredients so I played around. This is phenomenal; I wish I could give it 10 stars! It feels like a guilty pleasure, but there’s nothing to feel guilty about! I have made this for my mom who has an autoimmune disorder that she has recently figured out flares up with any type of sugar, even natural sugars like honey or maple syrup. She was overjoyed to be able to have a “treat” again. I also have a 6 1/2 month old that we have been doing baby led weaning and this is probably her favorite thing that she has tried, lol. Yay! Thanks for sharing, Ashton! Hubby has been lifting weights at the gym lately and was online last night looking for protein smoothies but none of them were wfpb. So I did a search and found your shake recipe. I did a test run last night and we both thought it was delicious! So I made 2 more batches this morning. The first one I added a scoop of vegan protein powder for my hubby before he headed to the gym, and my girls and I shared the 2nd. I see myself making this every day now! I’ll probably make another today and make popsicles ?. Glad you both enjoyed the recipe, Jennifer! Do you use raw cacao powder? will it be tasty? This was perfect in my hormonal frenzy to satisfy a chocolate craving. I made this, and it is amazing. Also, kosher for Passover! Glad you enjoyed the recipe, Danielle! Yum!! I only put 1/2 banana, no dates and it was perfect :) Thank you for this recipe. I don’t get it… I typed in things to make with peanut butter only, and this is giving me all kinds of ingredients that i don’t have. Hi there MB! I found your blog about a year ago, I guess, and you are definitely one of my first “go-tos” for truly fantastic tasteful and healthful recipes! I’ve been wanting to comment on that for awhile, and what brings me to this comment is that lured in by this great looking recipe, I wanted to ask your take on the ingredients of this brand of almond milk regarding healthful aspects of the product: Almondmilk (Filtered Water, Almonds), Calcium Carbonate, Sea Salt, Potassium Citrate, Sunflower Lecithin, Gellan Gum, Natural Flavors, Vitamin A Palmitate, Vitamin D2, D-Alpha-Tocopherol (Natural Vitamin E). Just madd this for bkfast and it is delicious!!! Made one additional and added 2 tablespoons of protein powder and used macadamia milk instead of almond. Thanks so much for the recipe! My kids thought it was ice cream. #momwin! Thanks for the great recipe! Omg I googled for some good vegan milkshakes using cacao last night and I made this one because it looked so simple and I had all the ingredients. I made it for my three kids and my husband and I and our minds weren’t blown. It reminded us of a chocolate frosty. Creamy, thick, chocolaty, sweet and a little salty. Perfect. Thanks for sharing! I’ll be making this again! This was amazing I added frozen apples and added dark chocolate almond milk. Did not use dats this is a great healthy snack ! Divine! Works well with soymilk and I used only 1 cup per serving. I doubled the recipe and added 5 crushed ice cubes and it was a perfect consistency. Note to self for next time: I would recommend a high-powered blender because there were little chunks of dates in mine still but it was still delish and I didn’t mind. Loved that it had no added sugar! Thanks Dana! I have all the ingredients except dates. Would the smoothie be ok without dates? Hi! The dates are used to sweeten the shake, you can sub it for your sweetener of choice or try it without! I don’t use dates in mine because it tastes sweet enough to me without. So it’s certainly possible and good, just maybe not as sweet as some may like. Best recipe! Added some vanilla plant based protein powder for more nutrition!! Just made this and it turned out super yummy! Definitely a keeper. I especially love the thick shake-like consistency. Thank you for sharing! hi this looks delicious! i’m making it right now. it says 2 tbs (32g) peanut butter and 1tbs (5g) cacao powder. did you mean 1 tsp cacao powder? WOAH this is amazing!! My kids thank you ? Dana, this was AMAZING! I am three days post stomach surgery, on a full liquid diet and this made my day. I could handle only 6oz so I made the rest into frozen pops–something to look forward to! I added 1/2 an avocado, some frozen, diced butternut squash and a handful of spinach. You couldn’t taste anything, but peanut butter and chocolate! Delicious! I typically love chocolate and peanut butter but I’m wondering if I can leave out the peanut butter when I want that pure chocolate flavor. Would that work? I’m am loving the idea of freezing this as popsicles! I will have to try that! I made this and it was absolutely delicious!!! I also added 1/4 cup of LSA with ice to make it a bit more substantial/meal replacement. Highly recommend it to anyone trying to eat clean and is craving a sweet treat! AMAZING!!!! I followed the recipe exactly and used two dates. I couldn’t believe that I was drinking something healthy because it was so sweet, rich, and delicious! Do you make the chocolate sauce by yourself? Hi! Yes! Find the recipe here! I just tried this smoothie twice, once over the weekend and a few minutes ago. The one I made today was delicious! My first experience was not quite there so I wanted to give a few tips on the optimal smoothie. The issue I had the first time, with the soaked dates, the smoothie’s wasn’t completely cold. Even with the frozen banana and cold coconut milk (I used coconut milk instead of almond), the temperature is what threw me off the first time. I also added too much liquid and no ice. What can I use in place of the dates? I hope to make this for my little girl and I but I hate dates. Minimalist Baker is literally my best friend. Honestly, it is so nice to just crave things, have an idea of what I have in my kitchen and minimalist baker ALWAYS keeps me covered. I don’t have to run to the store to get that 2 tsp. of one ingredient, and I know it’ll always end up delicious. I always end up using ingredients I didn’t expect to use but already have, and it always has the awesome, vegan nutrition needs I value in my food! Love this recipe. It’s dangerously good, as in, it’s soooo delicious you might want one every day kind of good! Have made it several times for my teenager kids when they get out of school and they love it. Sometimes I use peanut butter and sometimes almond butter….both are good. This recipe is AMAZING. It’s now a regular that I make :) I substitute the cocoa powder for vegan chocolate protein powder, and it’s a perfect drink as a snack, dessert, post-workout, or for any chocolate craving! boy oh mighty, she thiiiick, tho not succulent. The consistency was a pragmatic and exsistencial experience. This is an amazing recipe. We used refrigerated bananas and opted for the ice cubes, and multiplied everything by four so our family could enjoy it. SO DELICIOUS :) Thanks for a great drink recipe. It makes a solid chocolate milkshake. Great healthy snack to keep you full and give you some energy. My husband and I love it so much! I don’t have almondmilk, so I use coconut milk instead. also delicious. Thank you!! I was pleasantly surprised! Thanks for the delicious treat! I’m looking for a smoothie that calls for 6 dates. Will this smoothie still taste good with that many dates? Is there anything I could adjust to the recipe to balance out the sweetness? Thanks. More peanut butter will always balance out the dates! Good luck. I love it ! Definitely worth your time. Otherwise, no changes. This is incredible. I make this shake for breakfast quite often, it is one of my favorite shake/smoothie recipes! 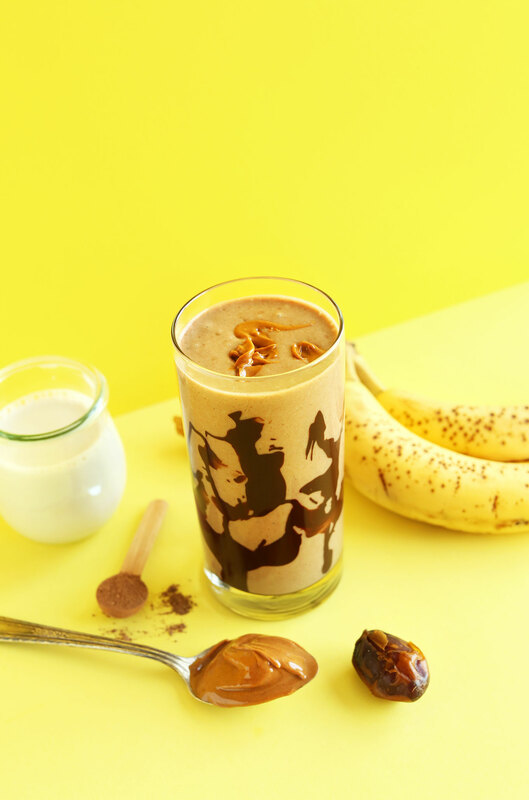 So yummy, it was like drinking a really thick and creamy glass of chocolate milk… Peanut butter + Chocolate = the best breakfast shake ever! “Oh my god. Oh my god. Oh.my.god” is literally what I said, out loud, to myself when I tasted this. This is the best thing that’s ever happened to me. Just made this and added protein powder as a post workout. Best smoothie ever!! Love love LOVE this smoothie recipe, so simple yet so delicious. 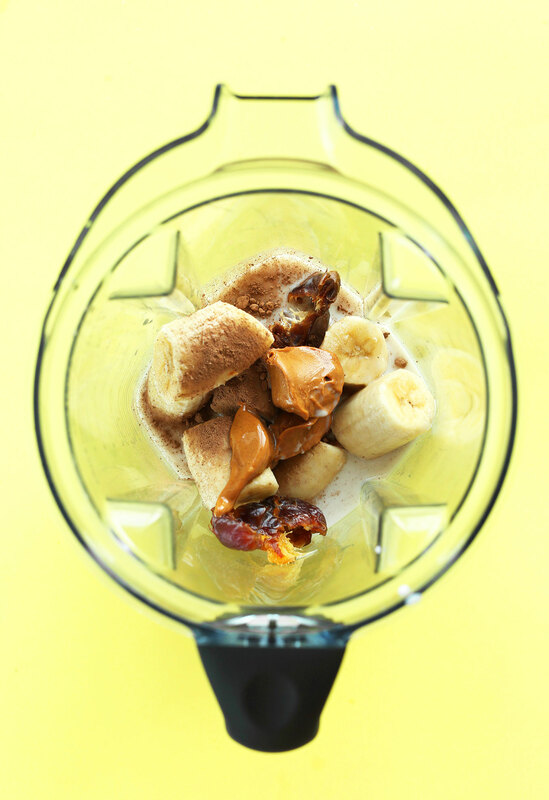 Peanut butter, chocolate AND banana in one healthy recipe? It can’t get better than this. I made mine with homemade almond milk which made it extra creamy and snuck in a teaspoon each of wheatgrass power and pumpkin seeds which were completely undetectable. Sometimes I omit the dates and I find it is still sweet enough. I make this smoothie at least once a week, it’s such a treat. Thank you Dana! I’m drinking it right now and it’s super tasty, but everytime I put dates into a smoothie I get all these little date chunks stuck in my straw. It must be my blender.. But besides that it’s great! And my name is Dana too!! I had to add about 3 bananas instead of 1 as well as ice to get it thick enough but it’s super yummy! Thank you! I want one of these every day! Updated! The good thing is all of the fat in this shake is from healthy sources. Even better, dip bananas in dark chocolate then freeze them!! Slightly defrost then add them to the shake! Makes it so much better!! I loved your recipe! Since I’m from Brasil and 1. We don’t have fresh dates in Amazonia 2. I’m not that healthy, I added reese’s sticks and dammmn! So delicious. We don’t have almond breeze either, so I replaced with fat-free milk. Still awesome :) thanks. I absolutely love this recipe. It’s so easy, but it tastes so good. I’ve been making this almost daily for weeks now. Thank you so much. I was pleasantly surprised how the texture of this smoothie was truly like a milkshake. It was wonderful! In both flavor and consistency. Made this shake for breakfast this morning, and added in some hemp and chia seeds. SO GOOD!! So chocolatey and delicious, will definitely be making this again!! Thanks Dana! Wonderful! Glad you enjoyed it, Emily! this shake is the BOMB! my daughters love it and so do i. so easy and seriously delicious. thank you for your amazing recipes! your site is the fist i check when looking to make something new and i love getting the blog updates in my inbox. CHEERS! Ha! Yes! Thanks for sharing!! Drooling is an understatement. Finding me some dates, like… as soon as earthly possible. I have a million and one dietary restrictions (it seems) and this site is everything to me, right now. Thank you for caring about food and making things delicious for those of us who don’t have time to figure it out!!! In your recipes, (such as this one) that ask for dates, do you use dried dates or fresh dates? Fresh, I believe. They’re always moist and tender when I get them. I’ve just made this for the second time. I used sweetened soy milk this time so I didn’t need the dates. It is so so good and guilt-free too! Thanks for sharing your delicious recipes and gorgeous photos! I change CACAO with CHOCOLATE and Almound Breeze with cream milk. The taste is very very sweet. If only Almond Breeze didn’t have carrageenan in it. As a cancer survivor I say, avoid the carrageenan! I use dark chocolate Silk instead… Makes the best smoothie ever! This is AMAZING. I have already made it and emailed it to 3 people. Thank you! Yay! Thanks for sharing, Amy!! This has been breakfast for the last 2 mornings. I just love eveything about it, taste, texture, super creamy awesome deliciousness. Go forth and blend, you will not be disappointed! Yay! Thanks for the love and feedback, Stephanie! I just made this for my dinner and oh, my god. Soooo delicious. Sadly we don’t get Almond Breeze in Brasil (a little help, please!) so i just made my own veggie milk. Probably not as creamy as originally intended, but still. Thanks for this life/sanity saver. What a great smoothie idea! I have never put dates in my smoothies, but I really want to try this one! 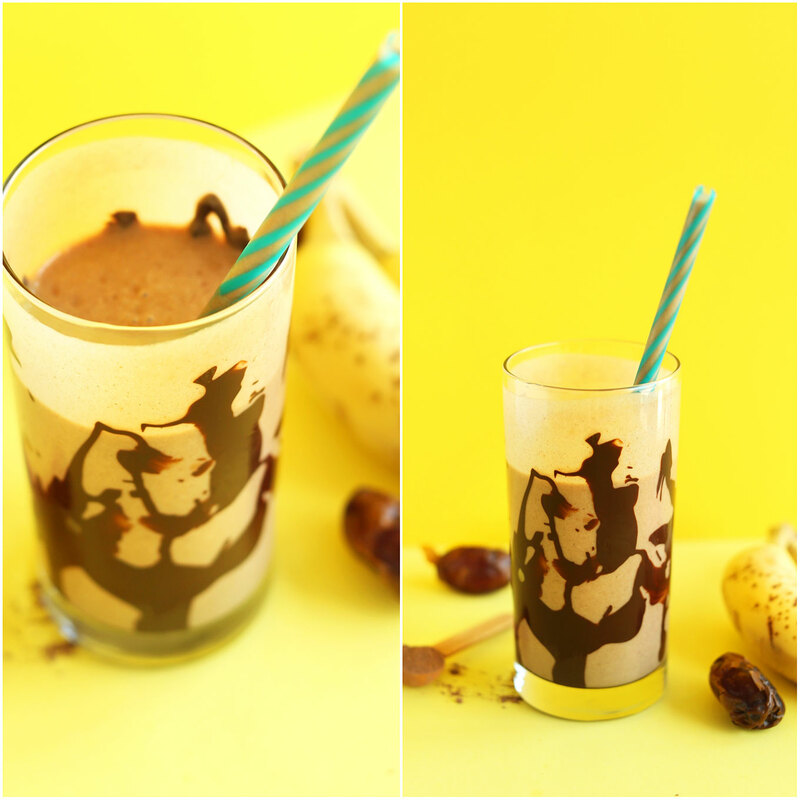 I love banana in my smoothies and I love the idea of putting frozen banana in! I’ve made this twice now and it is so good! The first time I was planning on taking a photo and using your hashtag, but I gobbled it up too fast. Whoops. Thanks for the great recipe! So grea!! Glad you enjoyed it, Allison! I’ve made this shake twice in the past few days! So good! I have a question, though. Do you have a trick to preventing date chunks? I soak them in warm water and I use a Blendtec. I don’t really mind them, but if I ever make this for friends I want it to be so ridiculously smooth that they can’t believe it! Hi Audrey! My best tip is just to blend super super well on high speed for 60-90 seconds. You can also soak and then mince them before adding to help with blending. Lastly, strain before pouring! Best of luck!! I made this recipe within hours of receiving it, couldn’t wait for frozen bananas. It was the heaven I expected it would be. I made it again this morning but instead of the peanut butter I used two tablespoons of the Simple Grain Free Granola. That made it even better! So great! Thanks for sharing, Karuna!! Uh-oh, now it’s a toss up as to which is my favorite…this shake (which is absolutely delicious), or your Creamy Chocolate Breakfast Shake (pure love). Haven’t tried freezing the banana ’cause I guess I’m afraid it’ll turn brown…I’m weird like that. But I do need to give it a try. Your blog is such a joy. Thank you! 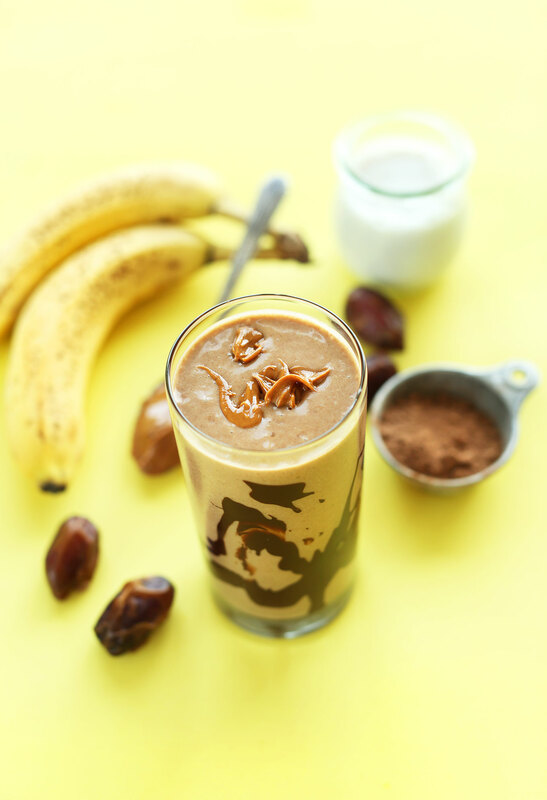 Our household loves PB + Banana shakes but we tried this one (with some additional ingredients from our norm) and it was a crowd pleaser. Thank you for the recipe! Great! Thanks for sharing, Rebecca! Glad everyone enjoyed it! Looks amazing! Any idea on the macro content? Love the dates in this shake! Honestly nut butter and dates have been a dream come true for me lately. For some reason I’m having a hard time finding really good ones unless I go to Whole Foods but sometimes that’s just what needs to happen. There’s a little cafe in Chicago that makes these incredible vegan smoothie bowls with coconut meat, banana, dates and almond butter. Looks like I have one I can make at home now! :) Thanks! It’s funny that I’m only seeing this recipe now because this has been my delicious breakfast for the last few weeks! However, my version is slightly different because my potassium levels get quite high when I eat a whole banana and dates in one day, so I omit the dates (it’s sweet enough for me with the banana) and use half a small frozen banana. Also I add in chia seeds and hemp seeds. Chia seeds + hemp seeds are lovely additions!! lol, I work at a pizza shop and have such a smell by the end of the night! Not to mention the layer of flour over everything. Dana, I’m catching up on your blog after not reading for a while, and I just wanted to say that your photography game is off da CHARTS. Like, amazing. Keep it up, girl! Ooh la la, sounds like my kind of treat! 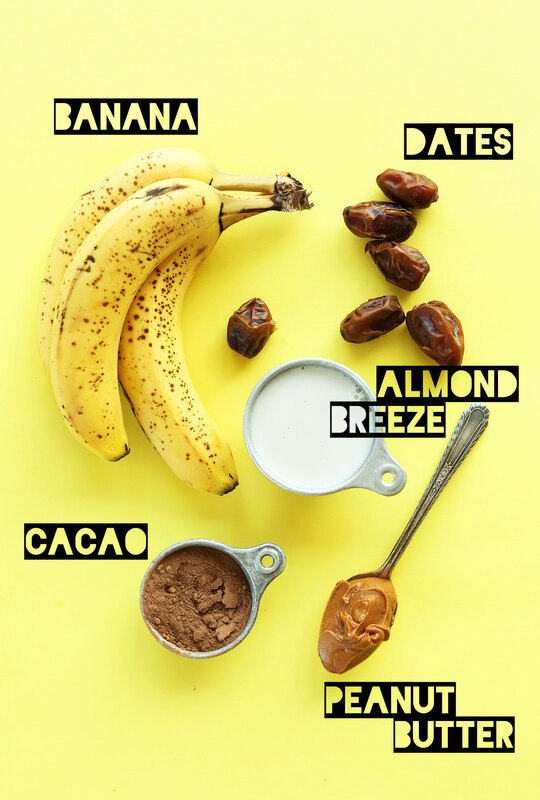 I make a similar smoothie sometimes but I never thought of using dates to sweeten! Great idea, I bet it adds a little extra caramelly sweetness :) totally going to add dates to my next one! Wow. 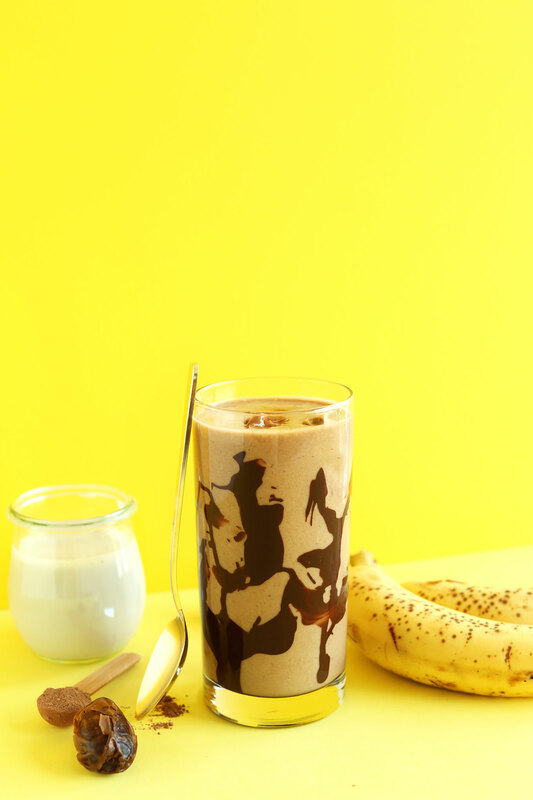 I love the way your chocolate peanut butter banana shake looks. It’s so healthy. I think that it would be great as a frozen popsicle. I will try this soon. Thank you for your post. Great idea! Report back if you try it! I just made this and it blew my mind. Absolutely delicious… AND tasted so much like a milkshake! Yay! Thanks for sharing, Rachel! It’s one of my favorite snacks for sure! And these shakes look ah-mazing. I love these flavors on their own, so combined?! YES! You can have it! I resigned like 10 years ago :D Hope you try this one, Abby! Let me know if you do, Lisa! OMG!!!! Where have you guys been all these time?! I was about to lick my monitor. This has just been added to my menu plan. For Friday (after gym dinner). Friday is sooooooo looooooong away. How will I cope? I love combining peanut butter with banana and chocolate always makes everything better! :) This looks delicious! Looks so good!! I have to get the ingredients to make this soon! ahh so thick and creamy! i need this now :) does anything else go better together than chocolate and pb? Yes please!!! This looks delicious!!! Hope you give it a try, Elizabeth! yummy, just made this and it was so quick. will post on instagram. Despite being cold and wet and 10pm right now in my corner of Australia…can I just say Y.U.M?! Vegan heaven in a glass… I’m still licking down the sides! “Basically, I looked and smelled like a giant popsicle by the end of the night.” – YES. I used to work at a cafe…I smelled like caramel macchiatos and steamed milk every night. It was like I was my own personal Yankee Candle shop. But this shake…yes please! Chocolate & peanut butter truly is the perfect pair. Can’t wait to try this recipe! Ha! I feel your pain.